OneDrive is a cloud storage solution available to Dartmouth students, Dartmouth staff, and Dartmouth-paid faculty. OneDrive allows users to easily store and share up to 1 terabyte of photos, videos, and documents. And the best part is that you can access these files anywhere, on any device. This includes integration with the iPad via various apps. This webpage outlines the process for setting up your OneDrive account as well as some of the apps that interface with OneDrive. For additional assistance, please contact Geisel.Computing.Support@dartmouth.edu or call 603-650-1600. You can also visit us in person in Vail 814. Note: This process cannot be accomplished via the iPad at this time. 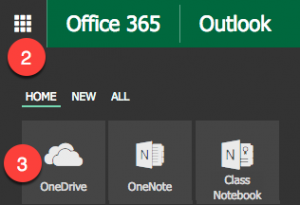 Once logged in, click the Office 365 app launcher at the top left of the page. From the resulting list, select OneDrive. This will create your OneDrive. Your OneDrive @ Dartmouth College Documents area should open. 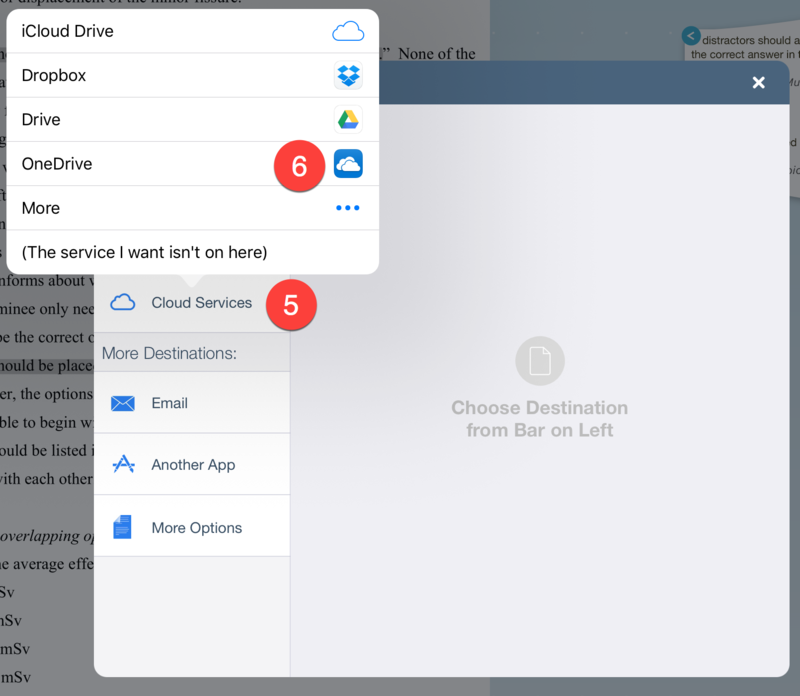 Within OneDrive you will notice a few panels, tabs, and options. Tap the Share icon at the top right of the screen. Select Send File LiquidText Can Open if you want a backup of the LiquidText file. Select PDF File to save a version of the file that can be viewed in other apps. Select Notes Outline to save the LiquidText notes to file that can be opened and edited in Word or Google Docs. Once the format is selected, a window prompting you to select a Destination will appear. 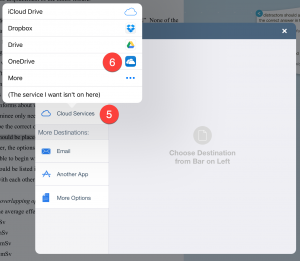 Click Cloud Services in the left hand menu. Note: you may be prompted to log in to OneDrive. From the OneDrive view, select the folder/location you wish to save the file to. With the file you wish to share open, select the Share icon. 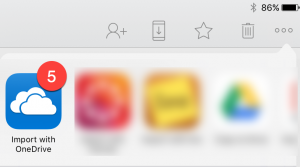 From the Destination window, select Other Apps. In the Other Apps prompt, choose the format you wish to share the file. From the apps list, select OneDrive. 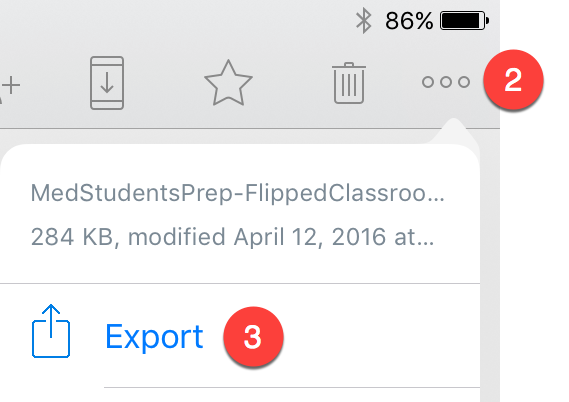 💡 Important Note: You can set Notability to automatically back up to Dropbox or Google Drive. This is highly recommended since there is no direct sync capability between Notability and OneDrive. It may occasionally be necessary to use an intermediary cloud storage application such as Dropbox or Google Drive that will allow you to send files to OneDrive. Click the ... icon at the far right of the document you wish to move to OneDrive. In the resulting window, select Import with OneDrive. Navigate to the folder within OneDrive where you wish to save the file. Select the ... icon at the top right of the page. Select Export from the resulting menu. 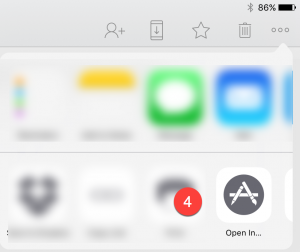 Select the Open In icon.